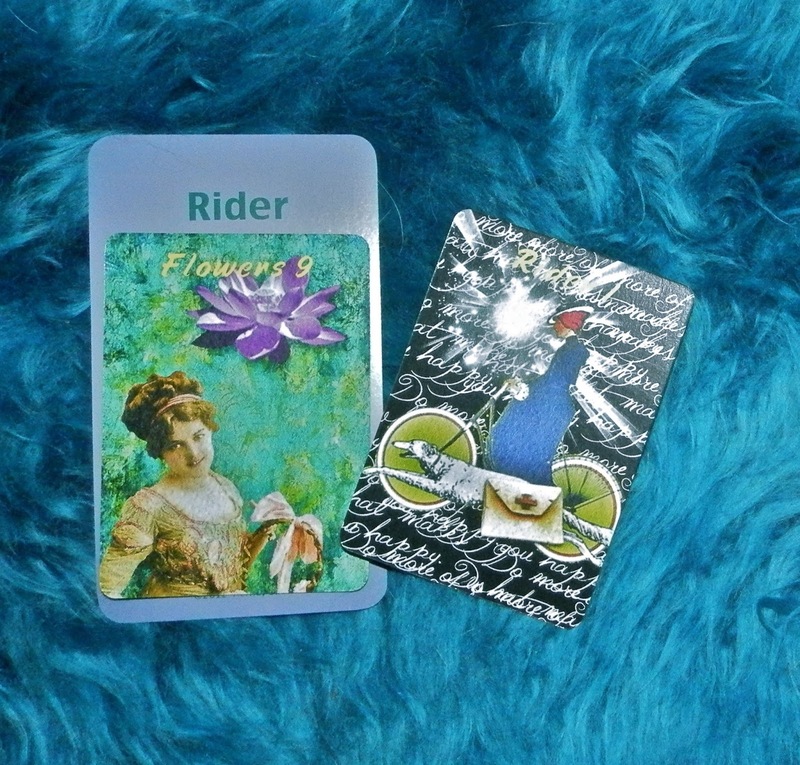 Today's Draw: Bouquet in the House of Rider from Bridgett Trejo's Vibrant Visions Lenormand and the Deck of Lenormand Houses. How often do you get good news and surprises? What's the best one you can think of receiving recently? Think back really hard...how many of these have arrived already this week? Aren't gifties fun? It seems like when we were kids we used to get lots of gifts and then when we become adults, the gift giving stops. Or transforms into the kinds of gifts you don't wrap, maybe. But I like the kind that jump out and surprise you, covered in ribbons. Or at least in packing materials. 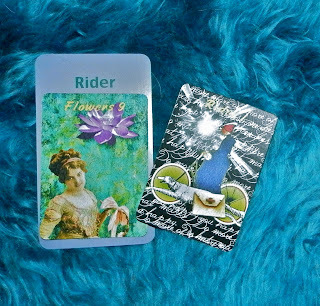 In a way, this Lenormand deck I'm featuring was a gift. It wasn't REALLY a gift, but it was a barter and came with the extra surprise of me getting one of the first ones. And it also came with the extra surprise of being so much more fun and colorful and lovely than it was in the pics I saw on Bridgett's site. There's just so much in the detail that doesn't come across in pics. There aren't two Riders in today's drawing. Just the House of the Rider, but I showed her Rider card because I liked it. The Rider is about news or something moving toward you. In this case, it's the gifts and surprises of the Bouquet card. But an extra little treat came from the writing in the background of the Rider cards which says "do more of what makes you happy", as though that's the directive the Rider brings. Anyhow, we say things like "giving is the true gift" or "I don't need any gifts when I have you". And all of that is true. But nothing beats a little surprise you either wished for or didn't see coming, especially if it turns out to be something you really like. I just read that one of my clients, who is a single gay man, got the news that the twins he's adopting were born this morning, six weeks early. That's definitely a Bouquet in the House of Rider moment. As I got to thinking about it in my own life, I just heard last night that me and one of my clients are on the short list for winning a nice account that we wanted. Also last night, I went to a School for Misfit Dogs class and when I walked Mystic around the parking lot, she was perfectly behaved, while the other dogs were distracted AND she walked behind me like good girls do. That's an incredibly positive development that really gives me hope that the days of Manic Mystic are numbered and the days of Mommy's Mystic have begun. In fact, the more I thought about good news and the arrival of gifts and surprises, the more of those things I saw in my life. Really. More than one per day, which is pretty cool. So it makes me think, how often does this happen that the moment passes by without savor or even acknowledgement as something special? And how different would our lives be if we DID savor it? I've always talked about how giving gratitude is the quickest way to get more of what you want in your life. What if you not only savored it, but were grateful for it? How might that change your life?